What did Malcolm X look like? Click here to find out. The movie Malcolm X is mostly accurate to the real life events and facts of Malcolm’s real life, although there are some minor details that were not accurately conveyed in the movie. In the movie there are many facts that were correct and accurate and there were also many events that were not correct and in line with reality. In the movie there are many major events and facts in Malcolm’s life that are correct and accurate with reality. In the beginning of the movie a group of clansman come to Malcolm’s home. At this time Malcolm’s mother was pregnant and the clansman left her alone, and left. In the movie it is mentioned that Malcolm’s uncle was lynched along with two of Malcolm’s father’s friends. In real life this is true to some extent. Malcolm’s uncle is lynched but the other two were unheard of. At a young age Malcolm sees racism towards him and his race. When Malcolm was 6 when his father was hit in the back of the head with a hammer. The blunt force trauma was not the cause of death. Earl Little was then pushed onto the track and was run over by a streetcar. In the movie it is never specifically stated that he was killed by KKK members, in real life Malcolm’s father were killed by these people The court said that it was suicide. During Malcolm’s life in the movie, he became a borderline drug addict. In real life he was not as associated with drugs as the movie portrays. He falls in love with a white woman and then the drug phase starts. He is charged with breaking and entering when he is younger. When going to jail he says the real crime was not breaking and entering with the judge, the real crime was sleeping with a white woman. This shows the racism in the court systems even at that time. He does not continue to date the white woman because when he is in jail he confronted by a man who tells him to seek Allah because he is the god of blacks. Malcolm is convinced so he shares his findings with his friends. Most of them think he is crazy. In jail no one knows what the guards do to him. We imagine that he was probably treated badly because of his skin color. Also in the jail Malcolm is in a sermon listening to a preacher. The preacher begins to talk about Jesus and his disciples. Malcolm gets into an argument and shows the preacher that he doesn’t know every thing he is talking about is true. Malcolm tells the preacher that because he cannot tell what race the disciples were he couldn’t infer what color Jesus was. The preacher takes it and backs down for all we can see in the movie. In the movie and in real life Malcolm is harder on the women of the Islam population than the men. He tells of how women need to dress nicer and not act like prostates. This is all during the time Malcolm is a part of the nation of Islam. What he doesn’t know is that many leaders of the nation of Islam are committing adultery, which is strictly against the Islam beliefs. Malcolm, not knowing this continues with his journey with the nation of Islam. Later Malcolm is addressing his people on the Kennedy assignation. He says that it was just justice being served. The nation of Islam says that they cannot associate with him anymore because it was racist. The head of the nation of Islam puts him on “mute” meaning he cannot talk to the press or talk for the nation of Islam. Because of this Malcolm leaves the nation of Islam and decides to travel. In the movie it shows him being followed by two CIA agents. This is not the case in real life. In real life it is just Mecca’s secret service basically. This is one of the very few facts in the movie that are not true in reality. In prison, Malcolm meets a man that tells him about Allah. While in prison they both go to the “library for prisoners” and look at a dictionary. They look up 2 words. White. Black. The word white showed up in this dictionary with words like “perfect” and “innocent”. The word black showed up as the opposite. “Without light” “wicked” “deathly” were words that Malcolm saw. This pushed Malcolm towards the Islam faith because he wanted to believe that he was an African in America. “A white mans country,” he says in the movie. This pushed Malcolm towards racism against whites. Malcolm was racist at one point towards white people then changed after he “split off” from the nation of Islam and went to Mecca on his own. When he was racist, many white people who wanted to further his cause approached him. They wanted to help. In the movie, when a white woman approaches him telling him that she thinks he is an amazing person and tells him that she is a big fan of his work and would like to help further his cause, he keeps walking and simply replies, “nothing”. There were things that Malcolm could have asked her for. He did not because it was frowned upon for an Islam to ask a white for help. 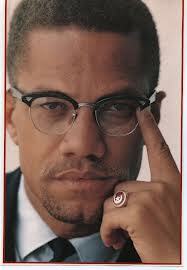 During his time in the Nation of Islam Malcolm did TV show and said over the air that white people were devils. He constantly says this in public everywhere until after his trip to Mecca. Malcolm worked on a train for a while in the movie. In the movie Malcolm is in prison when he hears that an African American has just been let into the MLB. Jackie Robinson. This was a significant part in the movie because this was the first time an African American was let into the MLB. In the movie one of Malcolm’s “brothers” is attacked by a police officer. The Islam population expects Malcolm to do something. Malcolm does. Malcolm hesitates then he starts walking toward the hospital with the Islam population behind him. They arrive at the hospital and Malcolm is greeted by a police officer. Malcolm requests to speak with a doctor even though the police officer claims that the victim is getting legitimate care. The group does not leave until Malcolm is greeted by the doctor caring for the man. Malcolm’s house gets set on fire. We do not know who set the house on fire in the movie but in real life the people who set the house on fire were suspected to be the black legion. One night before the house burns down a man from the Nation of Islam comes over to deliver something to Malcolm. He also tells Malcolm that his job was to plant a bomb in Malcolm’s car so when he turns the ignition his car explodes. The man doesn’t do it. He chooses to follow Malcolm. When the house burns down we do not know where the children and his wife stay, although we do know they received many phone calls that were threatening. Malcolm stayed at the Hilton in NYC and also received many threatening calls. The next day Malcolm goes to speak to a crowd and before getting up on stage he rethinks and thinks maybe he shouldn’t speak on this night cause something was telling him he shouldn’t. He disregards the feeling in his stomach and goes out to speak to a large crowd. In the middle of the speech someone stands up and makes commotion and runs out then 3 men (in the movie) pull out guns and shoot Malcolm many times, then run away before being stopped by both the police and many followers of Malcolm. Over all the movie was extremely close to the real life actions and events of Malcolm x’s life.